Despite the shrinking number of HIV infections and AIDS patients worldwide, the rates of HIV and AIDS among South Koreans has increased sharply over the past decade, data showed Tuesday. 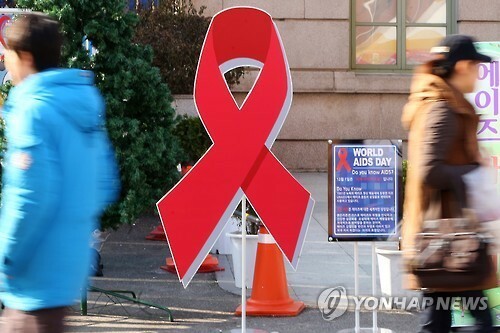 According to World Health Organization data gathered by the ruling Saenuri Party’s lawmaker Yoon Jong-pil, the number of new HIV infections and AIDS patients around the world decreased 35 percent from 2000 to 2015, while the number in South Korea quadrupled over the same period. In 2010, 219 South Korean patients were newly infected with HIV, while the number went up to 1,018 in 2015. Since 2013, there have been at least 1,000 new patients infected with HIV each year. According to data from last year, 93 percent of the newly diagnosed patients were men in their 20s and 30s. “Although South Korea’s Centers for Disease Control and Prevention is spending at least 9 billion won ($8.2 million) each year to fight and prevent HIV infections, it still lacks effort and strategic methods to lower the actual number of HIV-AIDS patients here,” said Rep. Yoon. Last year, there were 10,502 people living with HIV infections here, surpassing the 10,000 mark for the first time since the first HIV-positive person was reported in the country in 1985.